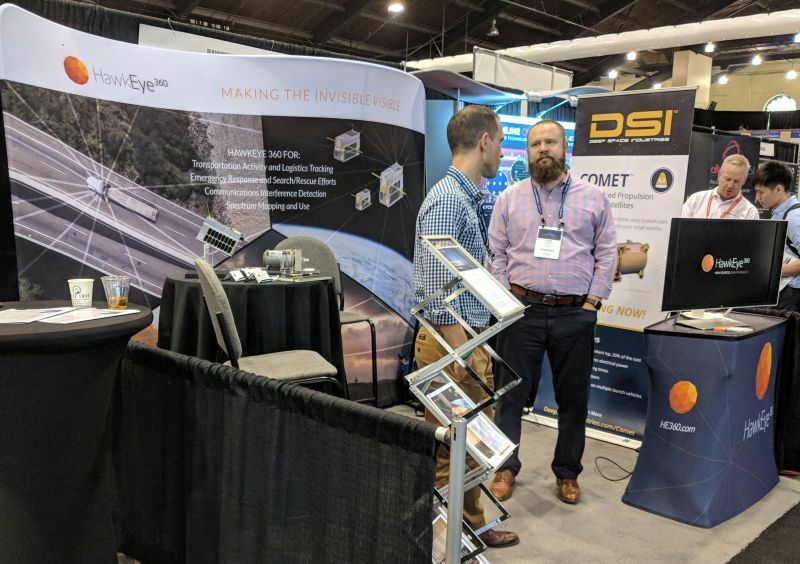 With the abundance of new small satellite companies, HawkEye 360 stands out as one that detects radio wavelengths instead of visible light (what your eyes can see). HawkEye 360 plans to create a constellation of at least eighteen satellites in clusters of three that will map and analyze RF signals coming from communications and transportation services. Its applications include identifying transportation activity and logistics tracking, emergency response and rescue efforts, communications interference detection, and spectrum mapping and use. HawkEye 360 has gathered an impressive team for their initial Pathfinder mission including a university research laboratory, an asteroid mining company and a space communications payload company. University of Toronto Institute for Aerospace Studies (UTIAS) has a specialty lab called Space Flight Laboratory (SFL) which has developed and refined microspace technologies for 22 smallsats in the last two decades. Though UTIAS-SFL has been contracted to develop the satellites using the Nemo-V1 satellite bus, the lab is actually a subcontractor for asteroid mining company Deep Space Industries (DSI). In addition to being a prime contractor, Deep Space Industries (DSI) is also providing an innovative water-based propulsion system. Meanwhile, HawkEye 360 has collaborated with GomSpace on the RF payload. HawkEye 360 satellite concept with each satellite 13.4 kg and having 40 x 27 x 20 cm dimensions. Propulsion system not depicted here. Credit: HawkEye 360. 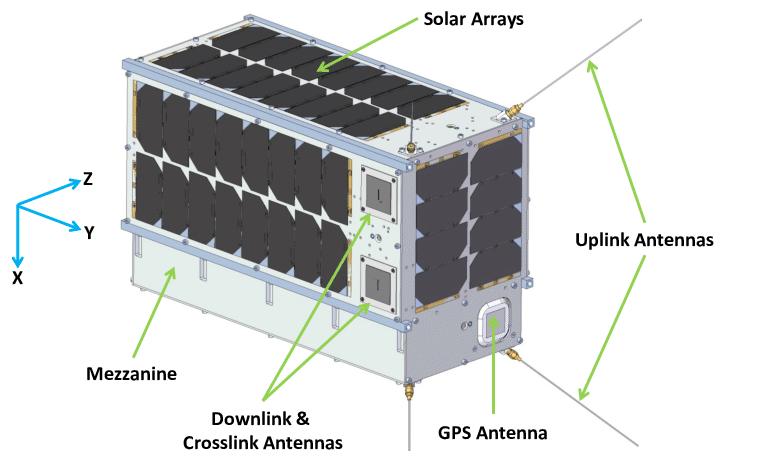 Each Pathfinder satellite, also known as a Hawk, uses the Next-generation Earth Monitoring and Observation (NEMO) bus developed at UTIAS-SFL. SFL has developed precise formation control on-orbit through the highly successful CanX-4/CanX-5 mission in 2014. It has 18 successful spacecraft missions on-orbit. Each Hawk has dimensions of 40 x 27 x 20 cm with a mass of 13.4 kg. The propulsion system is the Comet-1 developed by DSI. The Comet-1 is an electrothermal thruster that uses a high-temperature chamber to heat and exhaust superheated water vapor to produce thrust. In other words, this is akin to a steam engine. It uses an economical and safe propellant – water. The same propulsion system used on a Hawk will be implemented on DSI’s own asteroid exploration satellites in the future. 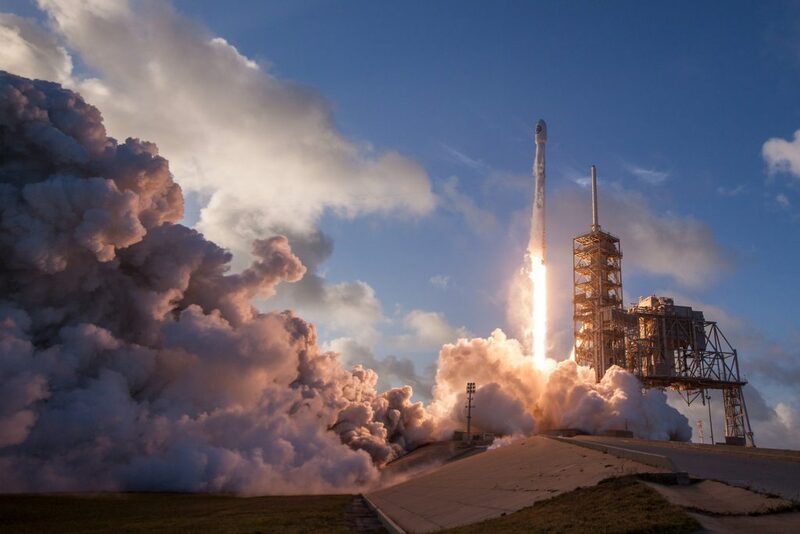 The initial three identical spacecrafts have as their primary payload a Software Defined Radio (SDR) and custom RF front end, along with band-specific antennas, all of which are developed by HawkEye 360 in collaboration with GomSpace. Initially, an eighteen satellite constellation (arranged as six clusters of three each) is envisioned for commercial global service with the eventual number possibly reaching 30. The ultimate constellation size and orbital parameters depend on market factors and client requests. When is the first launch? SpaceX’s Falcon 9 lifting off on a 2017 mission for the National Reconnaissance Office. Credit: Space X. The first Pathfinder cluster of three microsatellites will be launched later this year [2018 Q4] on the SSO-A launch to a 575 km altitude sun-synchronous orbit (SSO). The launch details and integration are handled by Spaceflight Industries while the actual launch is performed by a SpaceX Falcon 9. This will be the largest rideshare mission to date on an American launch vehicle with 71 small satellites onboard launching from the Vandenberg Air Force Base in California. These satellites will be fully operational and have a nominal lifetime of three years. The initial revisit rate (time it takes for the same location on Earth to be viewed) will be four to six hours and with more satellites this time will decrease. HawkEye 360 has selected Norway’s Kongsberg Satellite Service (KSAT) to provide ground station services for this mission and possibly future ones. The company is open to considering other launch providers. HawkEye has stated that they are agnostic about which launch service provider to use as long as the schedule, price, and risk makes sense. Why keep an eye out? HawkEye 360 continues to progress ahead with plenty of funding. Of most recent note, it has raised $9.6 million with Allied Minds investing $2.94 million in the first closing of a Series 3-A financing round. Other investors aside from Allied Minds include Razor’s Edge Ventures, Shield Capital and an anonymous American aerospace company. Allied Minds’ stake now lies at 50.8%. Correspondence with Adam Bennett at Small Satellite Conference in Logan, Utah. 8 August 2018.